The Mackie 3204VLZ4 32-Channel 4-Bus FX Mixer with USB from the VLZ4 4-Bus Series features Onyx microphone preamps in a high-headroom / low-noise 4-bus design with a feature set suitable for live sound. The mixer is equipped with dual 32-bit RMFX+ effect processors, each with 24 effects including tap delay. It also includes compression on dedicated channels and subgroups that allow for simple, sweet dynamic control. Additionally, both of the FX processors feature a tap delay and the delays may easily be synchronized with the song at the tap of a finger. The processed signal may be sent directly to the mains and monitors from the effects section or re-routed to the 2 stereo channels to bring them through the EQ and AUX section, utilizing the 60mm fader to draw them into the mix. The 32-channel, 4-bus FX mixer has 8 single-knob compressors to stop the dynamic signals from poking out of the mix. There are 4 compressors are located on the last 4 microphone inputs so that critical signals (such as vocals, snare drum, guitar or keyboards) may be addressed. In addition, there are single-knob compressors on each of the 4 subgroups so that grouped signals (such as a drum set or a choir of vocalists) may be blended together for paramount smoothness. This mixer also features a 4 x 2 USB recording and playback function. This means that up to 4 signals may be recorded simultaneously and a stereo mix returned to the mixer for playback. Its built-like-a-tank construction delivers years of reliable use under strenuous conditions. The VLZ4 4-Bus Series offers a compact FX mixer solution in a design that’s flexible, rugged, and professional. 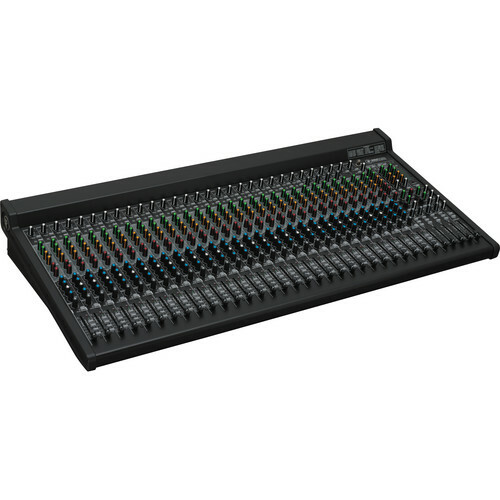 Box Dimensions (LxWxH) 42.0 x 23.0 x 10.5"
3204VLZ4 32-Channel 4-Bus FX Mixer with USB is rated 5.0 out of 5 by 1. Rated 5 out of 5 by Scott from World-class mixer at a reasonable price I needed a new mixer for permanent installation at my church. A friend of mine with extensive experience in the recording industry recommended the Mackie VLZ4 series for their build quality and design for live recording as opposed to studio recording (previous mixer was for studio recording). I went with the 32-channel model so that I could have everything plugged in at the same time: the 16-channel snake that runs to front of house, 4 wireless mics, 4 ceiling mics, and 2 computers. We have 4 mono channels leftover for future growth. I love that this board has everything I need (post-fader aux sends, EQ, compressors) and very little of what I don't need (FX). The sound quality is fantastic - very rich and warm natural sound. Many people commented to me about how big the thing is, but we had the space for it and the 24-channel model wasn't big enough for my needs.